Imagine why no one is placing a bid. Painful to look at, ain’t it? It ought to be because this was once a 2005 Ford GT, . And now it’s gone. Completely. Unrecognizably left as a pile of charred and twisted melted and ashes. It’s also for sale. As of this writing, not at all surprisingly, no bids have been placed on the auction website. This also gives a whole new meaning to being sold “as is.” So what happened to the GT that left it in its current state? No clue. Perhaps it was driven smack dab into a thick cement wall at 200 mph and burst into flames. Or, alternatively, its previous owner purposely torched it as part of an insurance scheme? Use your imagination. The charred remains bear absolutely zero resemblance to the car it once was, let alone a car in general. 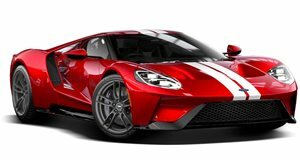 During its better years, this Ford GT came powered by a , packing 550 hp, all of which was directed to the rear wheels through a six-speed manual. Top speed? 205 mph. An analog supercar at its absolutely finest. All that’s left as semi identifiable as belonging to a car are parts of the exhaust, wheel, and a couple of coilover springs. It's a sad, sad end for a vehicle that was once the fastest production car Ford ever made. Unfortunately with fast cars comes a greater chance of bad drivers. So why the hell is it even up for sale? Best guess is that you’d be paying for the VIN, which is still identifiable. For what it’s worth, the sale does include a non-repairable certificate.